There is a widely believed superstition that an omnichannel investment is expensive, complex and disruptive. Central to this myth are twin villains: the first is Rip and the second, Replace. Their shared mission: drive up omnichannel costs to the point where it’s an unjustifiable investment, with slow payback and weak ROI. Rip and Replace is a product strategy as old as technology itself (aka, one of the oldest tricks in the book). Its core principle is intrinsic incompatibility. Company A tells you “we can build you an omnichannel—but we have to control each channel.” Everything Company A sells works only with Company A’s (or its partners’) other products. File formats are proprietary. The rules processor—the engine that drives strategic automation—only runs on its platform. Data can only be transferred across its specific network protocols. That applies to everything: from the IVR, to the CRM system, to the database for the mobile app. You have to stop using whatever you’re using now (that’s Rip’s job) and start using the products Company A builds or resells (Replace at work here). Let’s bust the myth. Rip and Replace are legends, like Freddy Kruger, when it comes to building out an omnichannel solution. There’s no need to reinvent the wheel. No need to get rid of one costly infrastructure just to replace it with another. No need to recreate all your apps or web functionalities or even physical store systems. In fact, there’s no need to touch any of your communications and backend systems and processes to create an omnichannel solution that’s seamless and transparent to the customer and the contact center agent. You just have to integrate them. It gathers and analyzes all the data from all your channels—as those channels exist today using the technology you’re using today. It executes business rules that you create, unifying data across channels that offer customers a seamless experience. Metaphor Engage is an omnichannel workflow engine you’ll control to establish new rules, modify existing ones. and apply them consistently to new channels anytime. Data from every channel is now available and known to every other channel. It transforms silos of technologies and processes into a harmonic ecosystem. You will know everything about your customer’s interactions, whether they happened via web chat, e-mail, in your IVR, on your website, . . . or any other channel you add in the future. And it does all this with whatever you’re currently using to drive social, mobile, wearable, online and physical customer engagement. So the cost of creating an omnichannel no longer involves the cost of Rip and Replace. And that makes it simpler, more seamless, and a whole lot less expensive than business has been led to believe. 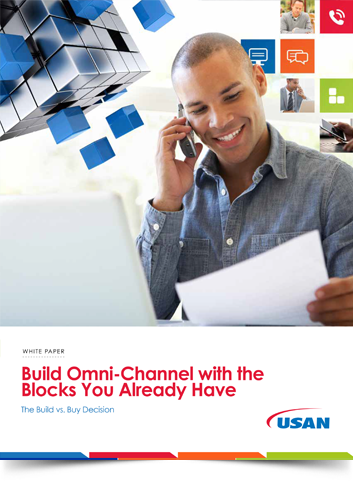 To learn more, download our white paper “Build Omni-Channel with the Blocks You Already Have”.